REVERSE KARAOKE – SING AND BE DISCOVERED! LaDiDa is a reverse karaoke app that uses artificial intelligence to help you sound like a professional singer. You SING or RAP into the phone, and LaDiDa will analyze your voice and compose music to match. Also works on melodic instruments such as GUITAR. Can’t sing? Doesn’t matter! LaDiDa can automatically tune your voice to the correct notes and add studio-quality vocal effects. RECORD: Choose your style & tempo and sing or rap into the mic. SHARE: Share your favorite songs with your friends on Facebook, Twitter and email. DISCOVER: Discover new songs performed by other LaDiDa singers and be the judge! LaDiDa brings the thrill of singing in a band to everyone! Sing into the mic on the Studio Page, and have LaDiDa accompany you. LaDiDa turns your iPhone into a live band. LaDiDa also uses tricks-of-the-trade to make your voice sound even better. 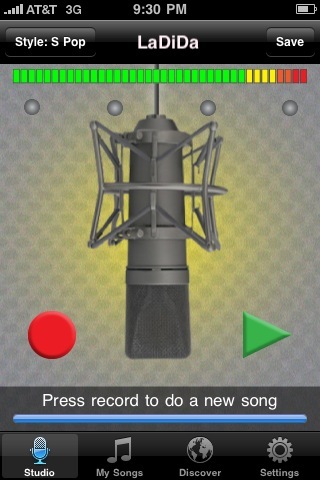 It’s a professional recording studio in your pocket. Dream of starring on reality TV or “getting discovered”? This could be your chance! Sing your favorite songs into LaDiDa, and it will compose the music for you. Share on Facebook and Twitter for the world to hear your talent.